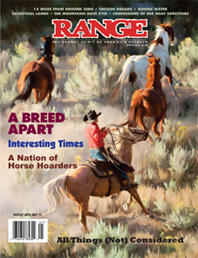 Enjoy award-winning, quarterly RANGE at a great price of $15.95 for 1 year! (Regular price is $19.95 for 4 issues). New issues are published in February (Spring), May (Summer), August (Fall) and November (Winter). Please allow 4-6 weeks for your first issue to arrive. U.S. addresses only at this price.